A black and white photograph of the Bible Class at the Whitby Methodist Church (Tabernacle). This photo was taken on the lawn in front of the residence of John L. Smith, lot 21, Broken Front Concession, Whitby Township. This Bible Class was taught by Mrs. John L. Smith. Mr. and Mrs. Smith were very involved in the work of the church and Mr. Smith was one of the founders of the Ontario Ladies' College in 1874. His house was built before 1877 and destroyed by fire in 1974. The Methodist Tabernacle was built in 1875-76 at the south-east corner of Centre and Colborne Streets. It became the Whitby United Church in 1925 and St. Mark's United Church in 1962. 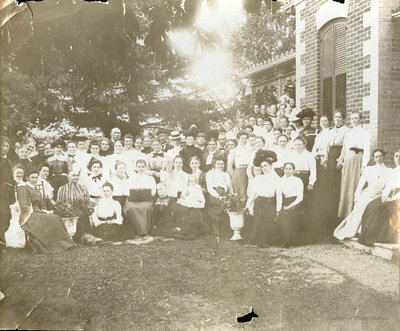 Brooklin Women's Institute, c.1910, Photographer Unknown. Whitby Archives A2014_008_001.